grandma's cookie jar: The Dr. Seuss Quote for Today is; "You Are You . . ."
The Dr. Seuss Quote for Today is; "You Are You . . ."
pleasant you are "you", but let's stop for a moment and see who God says we are . . .
John 1:12, "But to all who did accept him and believe in him he gave the right to become children of God." John 15:15, "I no longer call you servants, because a servant does not know what his master is doing. But I call you friends, because I have made known to you everything I heard from my Father." 2 Corinthians 5:17, "So then, if anyone is in Christ, that person is part of the new creation. The old things have gone away, and look, new things have arrived!" Ephesians 1:4, "God chose us in Christ to be holy and blameless in God’s presence before the creation of the world." Colossians 3:12, "God has chosen you and made you his holy people. He loves you. So you should always clothe yourselves with mercy, kindness, humility, gentleness, and patience." Wow! I'm God's child! I'm God's friend! I'm God's creation! I'm chosen by God! I'm loved by God! Yes, being all these things is pleasant! It is more than pleasant! It is awesomely amazing! Be sure to point this out to your grandchildren, too! 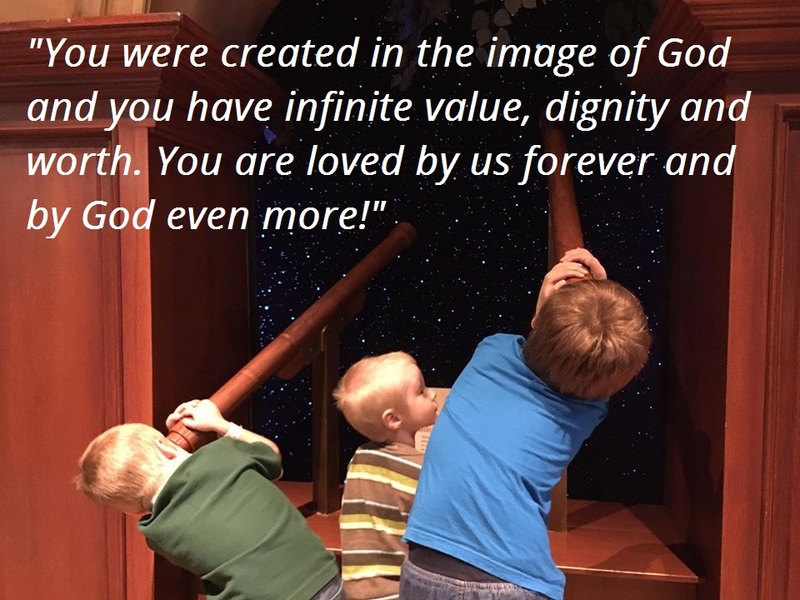 At the first-ever Legacy Grandparenting Summit this past November, Josh McDowell challenged us to regularly tell our grandchildren they are; "Created in the image of God and have infinite value, dignity and worth!" My husband and I have been doing this and adding, "We love you forever and God loves you even more!" 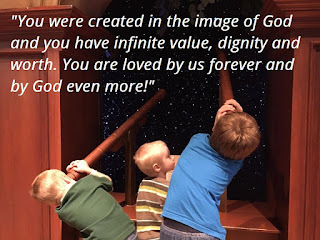 We certainly want our grandsons to see themselves as God sees them, so we need to be intentional about helping them do this. Talk with them about how it changes the way they live their everyday lives, every day to see themselves as God sees them. Give each of them five wide rubber bands and help them make wristbands - have them write, "I am God's child!" on one, "I am God's friend!" on another, "I am God's creation! ", "I am chosen by God!" and "I am loved by God!" on the others. Encourage them to wear one band a day and then to think about how God sees them as they go through their day! Be sure to take a moment to pray for each grandchild by name - "Thank You God for Your great love for _____ ! Please help him/her see himself/herself as You do and know he/she is Your child, Your friend, Your creation, chosen by You and loved by You! Thank You, Amen!"